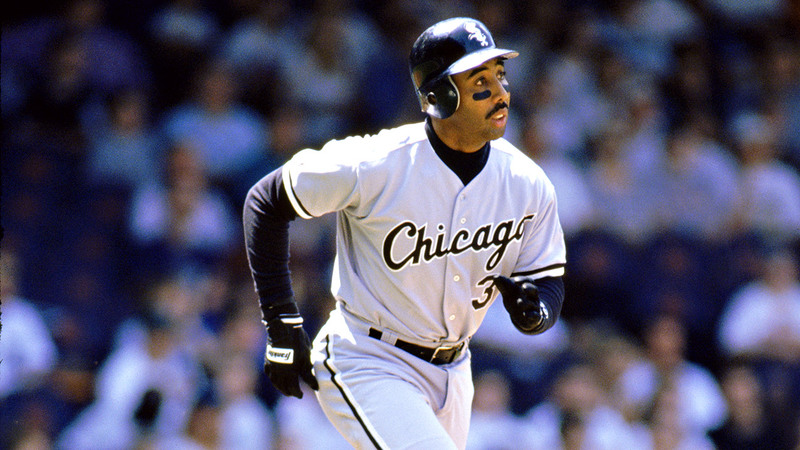 LAS VEGAS -- Harold Baines was given a save as big as any Lee Smith ever posted. In a vote sure to spark renewed cries of cronyism at Cooperstown, Baines surprisingly was picked for the Baseball Hall of Fame on Sunday after never coming close in any previous election. "Very shocked," the career .289 hitter said on a conference call. Smith, who held the major league record for saves when he retired, was an easy pick when the Today's Game Era Committee met at the winter meetings. It took 12 votes for election by the 16-member panel -- Smith was unanimous, Baines got 12 and former outfielder and manager Lou Piniella fell just short with 11. George Steinbrenner, Orel Hershiser, Albert Belle, Joe Carter, Will Clark, Davey Johnson and Charlie Manuel all received fewer than five votes. Smith and Baines both debuted in Chicago during the 1980 season. Smith began with the Cubs and went on to record 478 saves while Baines started out with the White Sox and had 2,866 hits. Baines had 384 home runs and 1,628 RBIs in a 22-year career -- good numbers, but not stacking up against the greats of his day. He never drew more than 6.1 percent of the vote in five elections by the Baseball Writers' Association of America, far from the 75 percent required. "I wasn't expecting this day to come," the six-time All-Star said. The Hall's board-appointed panel included longtime White Sox owner Jerry Reinsdorf. "I'm glad he was on that committee this year to help to get into the Hall of Fame," Baines said. Reinsdorf praised his former player in a statement. Baines currently serves as a team ambassador in the community-relations department of the White Sox. "So happy for Harold. He's a great player and a great human being," Reinsdorf said. "I am so honored that I was a member of the committee. He deserved to be in long ago. I am just so excited. "Not only was Harold one of my favorite players to watch, but I have nothing but admiration for him as a player and as a human being," he said. Tony La Russa, Baines' first big league manager, also was on the panel that elected him. In the past, Phil Rizzuto and Bill Mazeroski were among the players who benefited from friendly faces on Veterans Committees to reach the Hall. That panel has been revamped over the years, and the Today's Game Era group was created as part of changes in 2014. "The era committees were established as a sort of a court of appeals for an opportunity in the event that over time it was felt that maybe somebody slipped through the cracks," Hall president Jeff Idelson said. "And in the case of someone who received 6 percent of the vote in the BBWAA election, the reason that may have happened could be for many, many reasons." Baines, now 59, had a smooth, consistent, left-handed stroke. But he never finished higher than ninth in an MVP vote, and never was among the top five American League hitters in the yearly batting race. His single-season high was 29 home runs at a time when lots of players hit more. Smith's fastball helped him become a seven-time All-Star in an 18-year-old career. Known for his slow trudges from the bullpen to the mound, he owned the saves record when he retired during the 1997 season while with Montreal. Trevor Hoffman and then Mariano Rivera reset the mark. Smith never reached 51 percent in 15 BBWAA elections. Still, he kept believing his day would come. "I'm pretty patient, though, and I think I waited long enough. But it's sweeter," he said on a conference call. "You look at those things, well, OK, who's on the ballot this year? Who's on the ballot next year? But I'd never, never, never give up hope. "And then when they started with the second-chance ballot, I thought my chances got a little better. This probably today was probably the [most] nervous I've been with this Hall of Fame voting thing," he said. Smith became the seventh pitcher who primarily was a reliever to make the Hall, joining Hoffman, Dennis Eckersley, Rollie Fingers, Goose Gossage, Bruce Sutter and Hoyt Wilhelm. The 61-year-old has long worked for the San Francisco Giants as a minor league pitching coach and instructor. Baines was a designated hitter for much of his career after knee trouble ended his days in the outfield. DHs have struggled to gain backing from Hall voters. Baines joined Frank Thomas as the only players in the Hall who spent more than half their games as a DH. "Everything I hear or read is DH is really not part of the game, I guess," Baines said. "But I disagree. But maybe this will open up the doors for some more DHs." Both closers and DHs could see the numbers increase again very shortly. Rivera is eligible for the first time and big-hitting DH Edgar Martinez will be back on the ballot when results of the next BBWAA election are announced Jan. 22. Induction ceremonies are scheduled for July 21 at Cooperstown, New York. Between now and then, there's certain to be more debate about who else should be in the Hall. Drug-tainted Barry Bonds and Roger Clemens are on the upcoming BBWAA ballot, influential players' union head Marvin Miller has been denied seven times by various committees, and admitted steroids user Mark McGwire wasn't among Sunday's candidates.